Any objective assessment of developments in the South China Sea over the last few years cannot but conclude that Beijing is successfully expanding and achieving its goals, the ultimate being complete mastery over this body of water. Please note that we can no longer talk about “dispute” since this word fails to capture the essence of the conflict. There is also no point in demanding a “clarification” of Beijing’s objectives in a wishful attempt at integrating China into the post-war liberal order. Third, and most crucially, given that China is deploying a combined force made up of the PLAN (People’s Liberation Army Navy), a number of Coastguard-like agencies, and a maritime militia, military to military contacts involving only the former are not only useless, they are counterproductive. By engaging the PLAN, in a bid to build trust and work toward agreements, such as the much touted Code of Conduct in the South China Sea, maritime democracies are dangerously ignoring China’s playbook. The PLAN does not operate in isolation. Instead, it follows a carefully orchestrated script featuring an internal division of labour, the coastguard agencies, and the maritime militia. Each has its role, and in some situations and missions they act separately, while in others they work as a team. Broadly speaking, most of the “dirty work” is carried out either by militia-crewed (or at least coordinated) “civilian ships” or by their coastguard counterparts, with the PLAN free to play the “good guy” role in a discreet second line. This division of labour extends to diplomacy and military to military contacts: PLAN officers meet foreign counterparts, coast guard personnel keep a much lower international profile, and the maritime militias remain a domestic affair. This means that the objectives of these contacts are impossible from the start. What is the point of in engaging only the PLAN when it is just one part of the Chinese forces expanding in the South China Sea? How can we dream of integrating the PRC’s naval and maritime forces into some semblance of an international liberal order when the vast majority of their forces do not even take part in the exchanges and activities designed to bring this about? 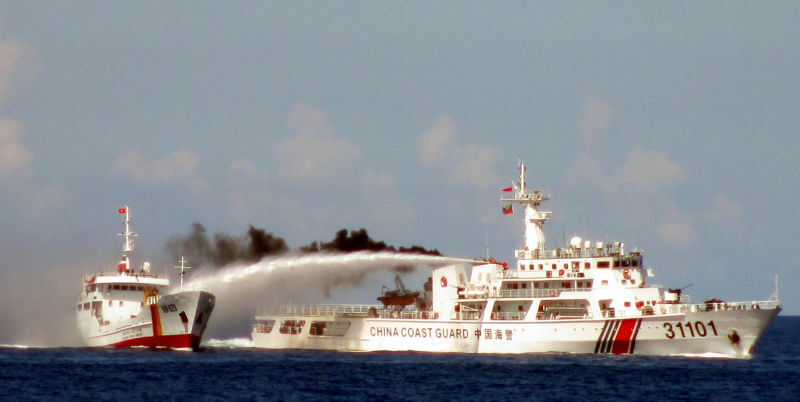 Heated altercation between a Chinese Coast Guard Cutter and a Vietnamese vessel in the South China Sea. One of the eternal principles of war is the need to seize the initiative. For too long maritime nations in the South China Sea have simply been reacting to Chinese moves, playing into Beijing’s script. The solution is not to complain more loudly every time Beijing expands, or to rearm at the conventional level only, the solution involves seizing the initiative, playing by different rules (not China’s), and forcing the PRC to react for once. This has already happened in some instances, most notably the Philippines’ lawsuit under UNCLOS, but must now become the norm, not the exception. A) Maritime nations must refuse to take part in any negotiations where China’s Coastguard agencies and maritime militias are not represented. Dealings must take place only with delegations made up of the full range of institutions involved in territorial aggression in the South China Sea. B) In order to make the above possible (and prevent Beijing from claiming that they are only sending PLAN personnel because they are just meeting naval officers), maritime nations must also include all equivalent agencies in their own delegations. C) Third, when a maritime democracy does not have a maritime militia, it must be created. This can be accomplished, for example, by resorting to reserve personnel, maritime industries, and yacht owners associations. 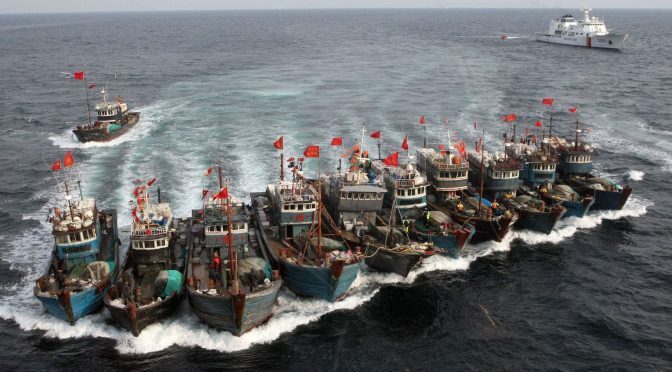 Maritime democracies may also need to adopt measures to grow their fishing and merchant fleets in order to acquire the necessary dual-use assets to wage the non-lethal confrontation seen in the seas near China. Adopting an integrated approach to military to military contacts with China may require some cultural and institutional changes. It may be understandable for a naval officer to prefer the company of a fellow officer from another country to that of a fisherman. Equally understandable may be an officer’s somewhat detached view of clashes among fishing boats, or landings by civilian “activists,” but the nature of the mixed warfare being waged by China means that superior conventional naval forces cannot simply wait for war to break out in order to defeat the enemy in a conventional battle. A war may be lost while waiting for it to break out. In theory, Chinese expansion could be checked by drawing a line in the sand and employing conventional force if necessary. However, this is politically unrealistic, given that not even economic sanctions have been discussed in Washington and pacific rim capitals. If the United States and her partners are not even ready to make China pay an economic price for aggression, can they be expected to go to war? The answer cannot be any other than a clear and loud no, and the Chinese are fully aware of it. Hence their “salami slicing” strategy. US Navy Arleigh Burke-class Destroyer and US Coast Guard Hamilton-class High Endurance Cutter at sea. If we rule out appeasement and surrender, then the only alternative left is to fight. Not to fight the war we would like, a war that is simply not on the menu, but the existing war being waged, and the one, we must regrettably say, which is being lost to date. In this war, the enemy is not simply using conventional forces, but a mixture of naval, non-naval state, and dual-use private assets. It is this complex reality that must be engaged with in attempts at confidence building and agreements negotiations. If it is not just PLAN officers working to conquer the South China Sea, what is the point in just talking to them? Shouldn’t we also be talking to their coast guard and militia counterparts? This broad approach to military to military contacts is the only realistic approach to the current situation in the South China Sea (and the wider Indo Pacific). If actually resulting in agreements, they will be more likely to be respected, given that they will have been negotiated by the whole range of actors involved. If unsuccessful, then naval and maritime personnel from the nations of these contested waters will have gained a much better understanding of their foes. This will not only give them a clearer picture of the opposition, but will also help them make the necessary but often difficult and even painful cultural transition from leaders used to thinking in terms of conventional sea power to officers equally at ease when facing a trawler or a submarine, a missile fired in anger or a ramming fishing boat. Successful riverine operations in South Vietnam are a good example of a similar cultural and organizational change brought about by the need to fight a dual war, and the resulting transformation is a reminder that this is indeed possible. Alex Calvo, a guest professor at Nagoya University (Japan), focuses on security and defence policy, international law, and military history, in the Indian-Pacific Ocean Region. He tweets at Alex__Calvo and his work, which includes “China’s Air Defense Identification Zone: Concept, Issues at Stake and Regional Impact”, Naval War College Press Working Papers, No 1, US Naval War College, 23 December 2013, available at http://www.usnwc.edu/Publications/Working-Papers/Documents/WP1-Calvo.aspx, can be found here. Previous PostIndia’s Role in the Asia-Pacific Topic Week Wraps Up on CIMSECNext PostThe End of Uniformed Naval Strategic Study?